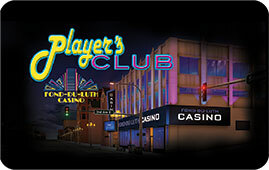 Thank you for visiting us at Fond-du-Luth Casino, we've got something reserved just for you – $5 in Club Cash. All you have to do is present a valid picture I.D. at Guest Services, fill out the registration form and you'll receive your very own personalized membership card. Now It Pays To Play Every Day. Make sure to use your card every time you play at Fond-du-Luth Casino. Just insert your new Player's Club card into the card reader of your favorite slot machine and watch the points accumulate! Remember the more you play, the more points you earn, the more benefits you will receive. You're already enjoying yourself on over 650 slots so why not get paid for doing something you like? Rules and restrictions apply for membership. See a Guest Services representative for a list of rules. Must be at least 18 years of age to join.